05/21/2018 New nano building block takes a bow (Link). 08/07/2017 Amir Aliyan successfully defends his Ph.D. dissertation. Congratulations Dr. Aliyan! 03/29/2016 Chengmin Jiang successfully defends his Ph.D. dissertation. Congratulations Dr. Jiang! 03/08/2016 Victor García-López successfully defends his Ph.D. dissertation. Congratulations Dr. García-López! 08/14/2015 Prof. Martí gives the Korea Lasertronix Young Chemists Lecture at the 45th IUPAC World Congress in Busan Korea. 07/01/2015 Prof. Martí is promoted to Associate Professor with Tenure. 03/19/2015 Prof. Martí gives the plenary speech at the 50th American Chemical Society Junior Technical Meeting. 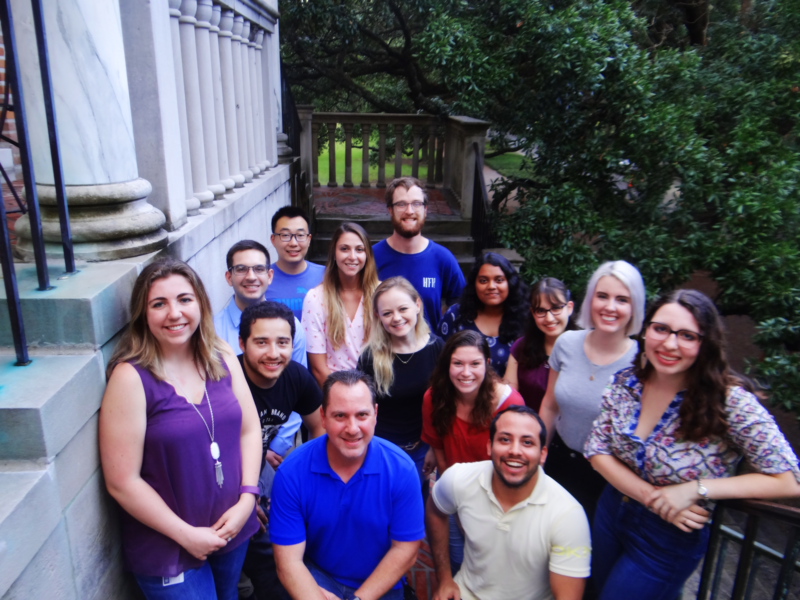 Welcome to the Angel Martí research group webpage at Rice University Department of Chemistry. We use inorganic chemistry, photochemistry, spectroscopic and molecular biology techniques to study problems in chemistry, supramolecular chemistry, nanotechnology and medicine. The design and synthesis of multifunctional molecular constructs for the treatment and diagnosis of amyloid forming diseases such as Alzheimer’s and Parkinson’s Disease. Probes for the detection of protein aggregation, amino acids, and temperature changes. Aided dispersion of single-walled carbon nanotubes by metal complexes and the study of photoinduced electron transfer reactions between metal complexes and carbon nanotubes. Study of the solubility, chemical reactivity and materials manufacture using carbon nanotubides and graphenides (chemically reduced carbon nanotubes and graphene). Surfactant-assisted dispersion and covalent functionalization of boron nitride nano materials. For more information about these projects follow the (Link) or check out our most recent publications. We are constantly looking for talented and motivated people to perform research in Chemistry, Materials Sciences and Bioengineering. To apply for postdoctoral positions please contact Prof. Martí directly.